The Filmlosophers, Eddie Villanueva and Chad Riley, welcome Aaron Carter from VideoGame BANG! 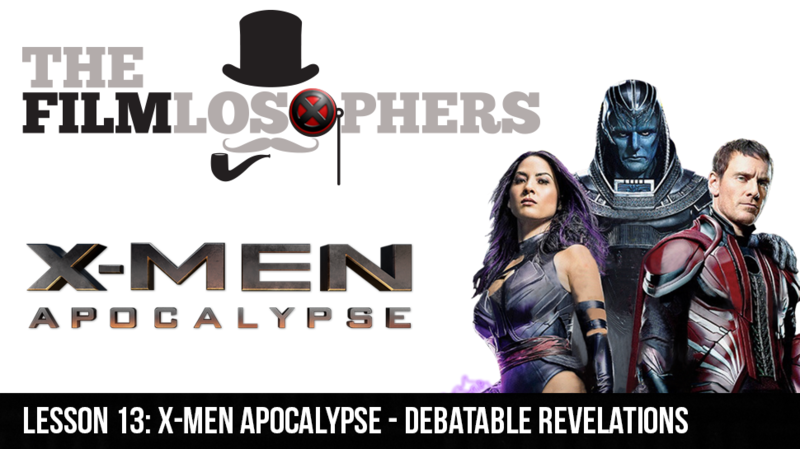 for a lively discussion of X-Men Apocalypse (2016), the latest installment of Fox’s mutant superhero franchise. What works, what doesn’t, and how does it all feel for two longtime fans of the X-Men comics? The crew also discusses a few fan casting options for key characters introduced in this film. Additional news items in this week’s episode include confirmed casting of Dwayne Johnson, The Rock, for a cinematic Doc Savage, some very candid feedback on Batman v Superman (2016) from “Alfred” Jeremy Irons, and a stunning reveal of the title character’s apparent allegiance in the new Marvel Comics series, Captain America: Steve Rogers #1.